Novāre Renovation & Design tackles a substantial Woodbury remodel to create an efficient space three generations of the Pierce family can call home. For tips on making the most of your home's space, click here. The three-person, Woodbury-based Novāre Renovation and Design team has embodied that word since 2009, coordinating home remodeling and design projects large and small throughout the region. Designer and co-owner Suzanne Pottinger and co-owner Tim Zilles did what they do best this past fall, reworking an awkward, sprawling home on Bailey Road for clients who needed a space as flexible and fun as they are. The Pierce family—Todd and Nicole; kids McKayla (15) and Arlen (13); and pet guinea pigs—moved into the home in summer 2017. In September, Todd’s parents, Dean and Marilyn, joined them. Months in, they were in love with the home’s gigantic windows overlooking a pond and a sprawling yard. In the 26’x26’ rec room, a former indoor pool space had become the perfect location for the Pierce Christmas gatherings—40 people and five trees strong—and the family’s frequent game nights. With Grandma and Grandpa living downstairs and Todd and Nicole and kids upstairs, that quickly became a buffer, a community space where all generations could unwind together. It was the space that best reflected the multigenerational lifestyle the family had envisioned in their new home—and they loved it. But there were some sticking points, too. “The home is … interesting. It’s like a duplex—with two front doors—but no division that a duplex would have,” explains Nicole. And because it was a standard, if puzzling, one-family home, it only had one kitchen, making it impossible for the two couples to enjoy a meal or entertain guests separately. 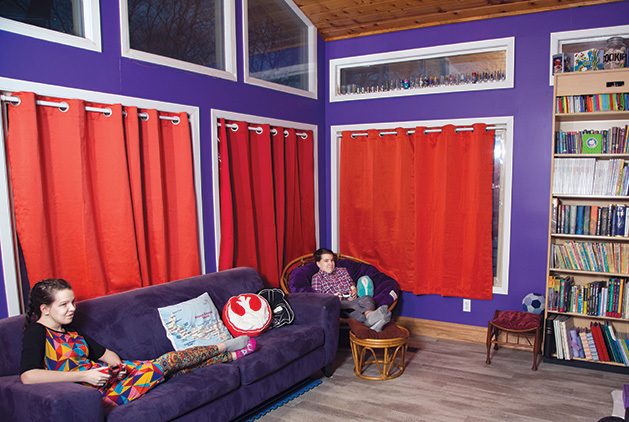 A chilly sunroom was doubling as Arlen’s bedroom, and that was more fun in June than January. There was no guest room, and a lack of storage meant coats and boots landed every which way when family members stopped home between items on their busy social calendar. Enter Novāre. A meeting with Pottinger in December 2017 detailed the family’s needs and goals for what they envisioned would need to be a massive addition. She quickly realized that the family didn’t need a bigger space, but a better one. She and Zilles put together a totally new floor plan—trimming a little bit of space here to add a little bit there—and planned small modifications to nearly every room in the home. “We were so impressed by what they came up with—things we didn’t even consider,” says Nicole. Pottinger and Zilles proposed adding a bedroom, half-bath, grandparent family room and guest room—without adding any square footage. And at every turn, the family was able to give their input. The planning started in early 2018, was underway by spring, and the family’s signature Christmas party happened in the finished space by the end of the year. Wherever possible, the team saved money by reusing materials, bringing windows from one spot to another and keeping every inch of trim they could. They turned to the Tile Shop and Ferguson Plumbing Supply in Oakdale for neutral tile and fixtures where they were needed. 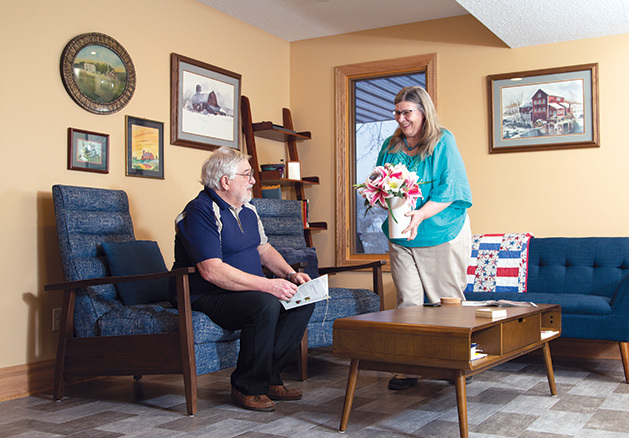 “The products and materials weren’t as much of a focus—it was really on getting the house comfortable for their multigenerational needs,” says Pottinger. The luxury vinyl flooring is low-maintenance; there’s original cedar planking and natural oak trim, and wood siding adds a rustic touch as rough-sawn boards under the loft. Where the family’s personality comes through is in the paint colors, which span nearly every shade in the rainbow.